Angela Meade, who's turn at the Met Opera National Council auditions was chronicled in the documentary The Audition , has, on more than one occasion, shown she's ready to step into the primetime ... ready to step onto the operatic A-List. Most recently, though - as in this last weekend - she proved that, as James Jorden put it in the NY Post, she is ready to step into "...the exclusive sorority of great Normas". The Washington born soprano rocked some serious Bellini while at the Caramoor Festival in Katonah, NY and trust me when I say, Friendlies... the reviews keep coming in for what seems to have been one hell of a Norma. 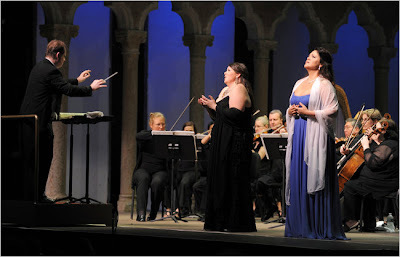 Anthony Tommasini of the NY Times said that Meade's "...stunning Norma was the big news" of the evening. Meade's is a very fine Norma -- and, as a first attempt at this Mount Everest of a role, it's simply a miracle." The Associated Press, which has the good or bad ability to immediately blanket a singer's Google responses, headlined their review "Angela Meade conquers Norma." ...The coloratura effects—rapid runs, trills, delicate turns, and so on—are handled with uncommon ease. She is a very musical singer, naturally and intelligently riding the phrase. Her tone has a distinct character, slightly darker than the coloratura norm yet warmly glowing. She doesn’t seem to make her voice do things; it is doing what it was born to do. As a friend remarked, you relax when you listen to her; you don’t worry for the singer, and lose yourself in the music. Could it be that we have a truly great singer on our hands? It would seem so. Now, Chickens ... it's no secret that Angela Meade is a healthy sized singer. I know... I know... you're saying: "Here he goes again ... always hearkening back to that certain General Director who told him that 'Fat doesn't make noise.'" Yes, I am hearkening as per usual. While I'm certainly not using the three letter "F-word" to describe Ms. Meade ... AT ALL ... There is a can of worms here and I think I need to crack that baby wide-open. So, let's do it - shall we? For the first time in a long, *long* time, we're hearing that a singer has astounding technique and has a voice that is "doing what it was born to do". She's "stunning" ... a "miracle" ... and has "conquered" one of the most difficult roles in the soprano repertoire ... at 32 years old. It's hard for Yours Truly to think that her healthy voice and her healthy sized body are just a coincidence. Right? I mean - come on. Have you heard of any 32 year old "little girls" who are conquering Norma on this kind of scale? Yea, not so much. All I'm saying is this: let's hope that as she continues move forward in her career she's not taken to task by the powers-that-be for her size - thus, forcing her into making unhealthy choices that will effect this astounding technique. Or worse, let's hope she is not blacklisted because she doesn't fit the HD Theater Screen mold... which is something I fear may be happening already. As for Meade's New York future, she's scheduled to sing a few performances at the end of the run of Donizetti's Anna Bolena, which will open the Metropolitan Opera's 2011-12 season (it's a vehicle for Anna Netrebko). But she won't be the first-cast soprano at the Met until that spring — this is 2012 we're talking about — when she'll appear in Verdi's Ernani, the role of her surprise debut at the house in 2008. I think it's a wise decision to take things slow, and build up Meade's big-role repertoire in smaller houses and festivals. But it's frustrating that a singer in her youthful prime won't be appearing in the City at all next season (unless Renée Fleming cancels one of her Armida performances, which Meade will be covering). Which reminds me: where was New York City Opera the past few years, as this phenomenally talented American singer was rising through the competition ranks? Ah, yes, I remember. City Opera was closed for two seasons! And even before that, someone reminded me, Glimmerglass Opera—which for a long time provided something of an out-of-town City Opera tryout—doesn't program much of the repertory at which Meade would excel. Well, George Steel, take a good look. Angela Meade is the kind of singer you should be building productions around. Here's to you, Angela Meade. Be proud ... *very* proud of yourself. What an amazing post! Thanks for this James. I have a friend at Caramoor who is completely smitten with her and now I see why! I agree that there's a correlation between her size and her voice. I mean, of course! Hopefully she will be the one who isn't forced to conform.